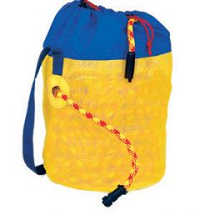 This custom made ComRope Bag is manufactured from a heavy duty, high visibility mesh that features a reinforced mouth with an adjustable draw-string Nylon cord. A convenient opening on the side of the bag allows you to access the topside connection of the ComRope. ComRope bag is a must have on any dive site running Hard Wired Communications. It allows you to easily manage up to 200' of rope in a single bag. The ComRope Bag is the perfect accessory for tenders who require portability.